The beauty industry is all about charming the clients, and making everyone feel comfortable. Tennessee is a great place to find the right schools to teach you the southern charm you need for a career in cosmetology. If a career learning all the best beauty secrets appeals to you, you will love the opportunities you’ll enjoy with a career in cosmetology. Getting your license doesn’t have to be overwhelming. This article can help you learn what to expect. 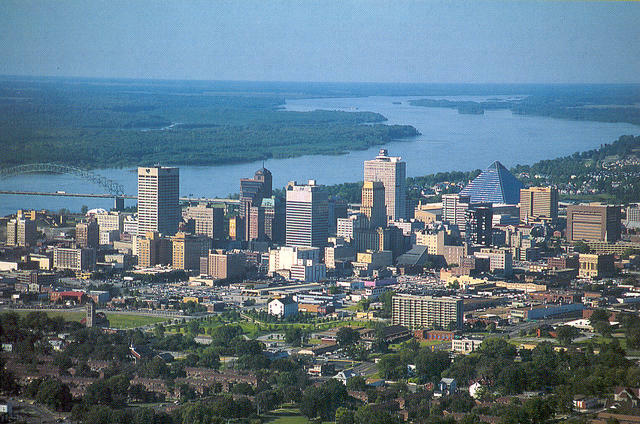 Memphis, Tennessee from the air. In order to become a licensed cosmetologist in Tennessee, you will need to be at least 16 years old, and have at least a 10th grade education or equivalent. If you are currently still in grade school check to see if there are any high school cosmetology programs available. You’ll have to find the right school or program amid Tennessee’s 80 cosmetology programs. Make sure you shop around as beauty school costs and quality of education varies. You’ll have courses in coloring and cutting hair, hair relaxing treatments, skin treatments, and salon management, along with other courses. You may choose to specialize in hair, nail or skin care, but the more diverse your program, the more desirable you will be to employers. Tennessee requires 1500 hours of study (which is about average) before you qualify for your exams. 1500 hours translates into a year or more of full-time training, so if you want to learn cosmetology part-time or at night you will be in school for more than two years. Once you can prove you’ve met the education requirements, you can take your exams to be licensed. The practical exam is about three hours long. The written is about two hours, and multiple choice. You’ll need at least 75% on both to pass the exams. The testing facility will forward your scores to the TN Board of Cosmetology and Barber Examiners, and once they have verified you, your license will be issued on payment of the licensing fee. If you are moving to Tennessee from another state, and you want to make sure your license will remain active, there are a few things you need to make sure of. First, check that your home state’s licensing requirements are equal or greater than those for Tennessee. If your home state’s education requirement is less than 1500 of study you can substitute for hours worked. You need to prove that you have worked as a cosmetologist full time for at least five years. You’ll also need to take the Tennessee State Laws and Regulations Exam, which will familiarize you with the laws pertaining to cosmetology in the state. Your Tennessee cosmetologist license should be renewed every two years. It will expire on the date of issue. You can renew your license up to 60 days before it expires. No continuing education is required, but you will need to pay a fee. When you’re looking for your first jobs in the Tennessee beauty industry, you’ll likely start in a chain store or salon. By building up a client base, you may soon be able to rent a chair in a salon, or go freelance, and work from home or from an office. If you’re struggling to find work, check with institutions like the Tennessee Beautician’s Association. Other Tennessee schools for nail technicians, estheticians, barbers and makeup artists. Did we miss any cosmetology schools in TN and especially hair schools in Memphis TN? Please let us know.